Congressional Cup racing was again postponed this morning as an unseasonable storm buffeted Southern California. But behind the tempest came clear skies and a steady breeze that climbed from 10 to 16 knots as the last matches of Qualifying and the bottom six repechage were smartly waged. Earlier in the day, PRO Randy Smith had cancelled the second of the Qualifying round robins, due to lack of time to complete it. Advancement would rely on their standings after the single round robin followed by a six team Repechage. After a tense wait, the results of a tie-break were announced: including a surprising penalty against Ian Williams (GBR) that bounced him out of the top six. Advancing directly into the Quarterfinals were (in order) Taylor Canfield (ISV), Reuben Corbett (NZL), Phil Robertson (NZL), Joachim Aschenbrenner (DEN), Bjorn Hansen (SWE) and Chris Steele (NZL). The remainder – Ian Williams (GBR), Keith Swinton (AUS), Scott Dickson (USA), Przemysław Tarnacki (POL), Eric Monnin (SUI) and Dustin Durant (USA) – began the first of a five flight Repechage stage to determine which two will make the Quarter Finals. Three Flights were completed and fast out of the blocks were Williams and Swinton who marched to a 3-0 score leaving them in a strong position to advance but six team rounds are notorious for horrible ties so anything could still happen tomorrow. 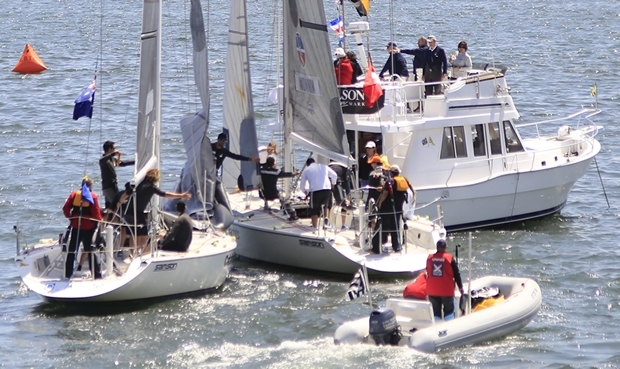 The battle to stay alive in the 51st Congressional Cup continues at 11.30 PDT, Saturday 16th May, directly off Long Beach Belmont Veterans Memorial Pier – a thrilling vantage point to watch world-class match racing, right under your nose.